… my way of giving credit to my culinary caretakers, aka the people and places that make my foodie heart skip a beat. They may not be extravagant. Sometimes, they may be very simple. It’s just the food that makes me joyful. 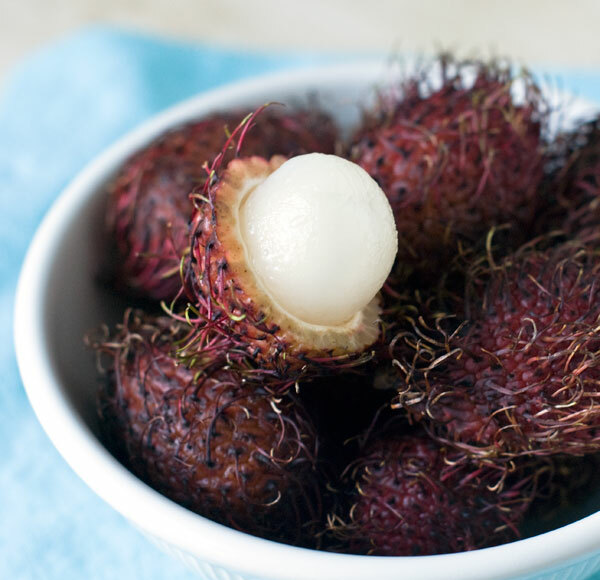 In Malaysia rambutan (rhom-boo-ton) literally means hairy. These sweet tropical fruits are native to Malaysia and other parts of Southeast Asia. While I studied in Thailand, my Thai teacher used to provide snacks for her bright-eyed, foreign students. Each day, after learning another list of vocabulary and playing language games, the class was rewarded with a Thai treat. Slightly smaller than kiwi, these funny-looking fruits appeared one day. After asking what they are called, ajan (teacher) replied with ngoh. I originally thought she misheard my question, so I mistook her answer to mean “No, Lauren, you cannot eat those now.” After the mix-up, I never forgot the Thai word, but unfortunately never learned how to translate it to English…until last weekend. I had a nostalgic moment after finding these lychee-like fruits on the streets of Chinatown. Turns out that in the United States, they are referred to by their Malay name, rambutan. The fruits definitely appear quite odd, somewhat reminiscent of the aliens from the movie, Critters. That visual aside, these are super-sweet and delicious! Their leathery skin can easily be cut or peeled to reveal a juicy, white flesh. There is a pit, but it’s easy to remove. oh! Those look like they would be fun to eat! I ate one of these at the International Festival today! They’re yummy!